Wool blend tote bag. Looking for a warm and comfortable carry all this winter? Just arrived... the new Windsor tote, part of our fall-winter collection. Classic navy blue wool-blend tote bag with faux leather handles. Spacious interior and the latest style. A classic shape that is always in fashion. Take it shopping, on a winter get-a-way or a great city work tote to keep all necessities within easy reach. Add our new accent monogram for a new look. NOTE.. 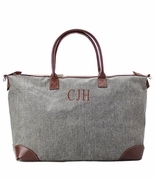 ACCENT MONOGRAM IS APPROXIMATELY 1" AND IS PLACED UNDER AT THE TOP OF THE TOTE BETWEEN THE HANDLES. Wood tote bag measures 17"W x 13.5"H x 8" across bottom. Lined with two open inside gusset pocket. Open tote.